A comprehensive examination of the ways in which Israel’s history, ethnic diversity, geopolitical situation, accelerated change, religion, and social structure influence the Israeli Mindset. This segment is designed to provide attendees with a critical tool for succeeding in Israel. It provides the tools required to understand the rationale driving culturally generated challenges encountered in Israel and equips seminar attendees with an intellectual framework from which they can build effective strategies and solutions, both personal and professional, for accomplishing their prescribed overseas tasks. A thorough review and analysis of the unique attributes of Israeli business culture, this segment is intended to provide a platform for identifying, comprehending and resolving specific business culture differences that may affect a trainee’s overseas performance. Using real case studies and workbook exercises, attendees examine, identify and learn to accommodate Israel’s unique business culture and the Israeli way of doing business. Subjects covered include: Israeli management styles, team building, communication techniques, time management, workflow patterns, hierarchy structures, meeting formats, protocol issues, business manners, gender roles, conflict resolution and ethics in Israeli business environments. This session integrates skills, tools and information acquired from previous segments with a practical, discussion based investigation of specific business objectives participants will face in Israel. Session material is highly customized to investigate particular assignments, objectives, or goals in Israel from a cross-cultural viewpoint and to provide practical, action-item remedies for achieving business culture synchronization with Israeli counterparts. A discussion format allows participants to envision possible culture-driven challenges and propose solution strategies that can be debated and evaluated in an intellectually enriching group format. 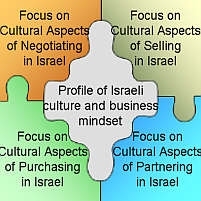 Whether focus is placed on negotiating, selling, buying or executing any other business activity in Israel, emphasis is placed on training participants to apply best-of-breed strategies for motivating, communicating, teaming and resolving conflicts with Israeli partners.